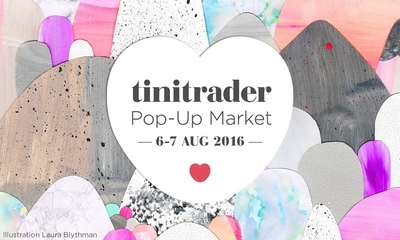 Tinitrader invites you to shop at a special styled pop-up market in Abbotsford this August. This FREE event will see Australia's best online marketplace come to life for 2 days. See the very best of Tinitrader's baby and kids products curated in a styled shopping space. Whether you are after a gift for a friend's little one or a treat for your own child, this is your opportunity to shop up a storm from over 40 of the best independent children's boutique brands. This is also a chance to be inspired on ways to decorate your child's space, because the event will be styled by interior extraordinaire, Aimee Tarulli. There's no need to leave your kids at home either, because in addition to the styled rooms and 30 plus stalls, there will be a kid-friendly outdoor café and kids activities including a crafts table (thanks to Habitots) and a visit from Peppa Pig!